No too many Americans dare or are willing to quote this today, either because they don’t believe in it or they will be considered politically incorrect if they do so. But the question remains: If enough American people no longer hold America’s founding principles dear to their hearts, will they, and should they, be loyal to the political system and way of life that the founding fathers designed under those principles? That’s why we need to give people like Donald Trump and Steve Bannon credit for considering this question. Steve Bannon clearly showed urgency when he talked to the California Republicans in Anaheim on Oct. 20. He believes now is a momentous time, the great Fourth Turning in American history after the Revolution, the Civil War, and the Great Depression. To Steve Bannon, in a sense, this is a “to be or not to be” question for America, and he is ready for the fight. His route? Victory begets victory, and that means he will not be able to fight an ideological war only. He needs to get into the trenches of practical politics. While talking to 500 enthusiastic Republicans at the California GOP convention, Steve Bannon did not shy away from naming the establishment as part of a great detrimental force against the country, even though it was the establishment that invited him there in the first place. However, the vision he laid out for the conservatives of the country was not exactly a populist one either. He called for a coalition that included the establishment. He turned against George W. Bush, not so much because Bush represented the establishment, but because he loathes the China policy from the Clinton and Bush era, which he believed dragged part of America into an opioid crisis that has damaged the country. Yes, he hates losing. However, he might well believe China is why Donald Trump won. And it is the Upper Midwest that helped secure the presidency for Donald Trump. 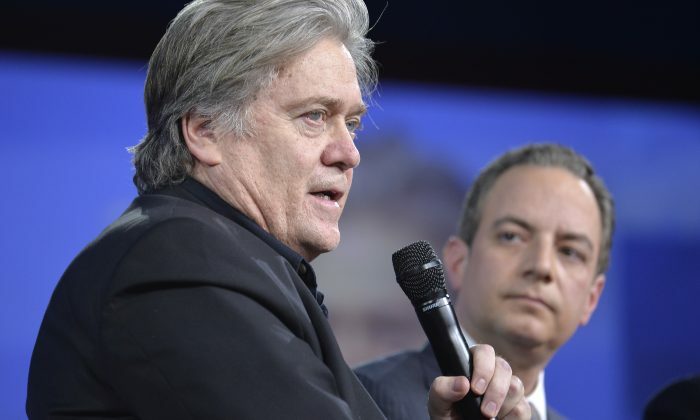 Bannon’s victory-begets-victory strategy gained some momentum recently after Judge Roy Moore’s win in Alabama’s Republican primary race for the Senate seat. Bannon said it is a $2 million against $32 million win. The evangelical Christians and populist-nationalists joining forces for victory against the establishment, which was backed by big donors, sends a strong message. He said the establishment finally gets the “joke.” The recent Senate passage of the budget and tax reform bill might be another footnote to that, as the establishment has joined in supporting tax reform. But Trump and Bannon have a long way to go. If they want America to return to the one bequeathed by its founding fathers, it cannot be that there is only 51% of the country on board. Getting the rest of the people is hard, but it is not an impossible mission. President Ronald Reagan gained a larger majority by depicting a shining city on the hill, accompanied of course, by a booming economy in the wake of a successful tax reform.